Posting to Word Press Again . . . Therapy, in its traditional form, is all about the client–so the books say. And that is true, to a point. My therapist’s job is to help me undo the damage done by people in my past, the damage that underlies my Complex PTSD. And I have come a long way, thanks to her skillful help. She is a clinical psychologist, and I am her client. So–what does this mean, exactly? I can’t answer that question for anyone else, but I can partially, at least, answer it for myself. During my first two-plus years seeing my therapist twice a week, I worked with my ego states to bring them to something resembling harmony: not an easy task for somebody my age! Over my 74 years of life, I had developed a lot of ego states, and it took me a while to identify and define most of the parts within my psyche that make up my “self.” I’m not certain that I’ve identified all of those parts yet, but I identified enough of them to enable me to do what I have needed to do to alleviate my PTSD symptoms. This was work I had to do on my own, for the most part. In fact, I did my ego state therapy work at home. I wrote a dialogue or script of more than 1,000 pages in which my parts interacted and worked together “to promote the recovery and the happiness of Jean.” Where did my therapist come into the picture at this time? She listened to me read installments of my dialogue, she encouraged me, and she witnessed my progress. The few times I seemed to veer off course, she helped me find my direction. During the time I worked on my dialogue, my therapist and I interacted in my sessions and worked on our own relationship. Thus, by the time I had gone as far as I needed to go in this part of my therapy, I was able to transition into the phase of therapy where she and I worked with EMDR, and that is where we are now. Oh, I can always return to my dialogue when I need to do that, but now our focus is on EMDR and trying to shift trauma energy from my right brain to my left brain so I can understand it, talk about it, and then let it go. My therapist facilitates this shifting of energy by tapping first on one knee and then on the other, bilateral stimulation, as I actively recall the events connected to childhood traumas. I am doing the remembering, and I am processing the traumas, and she is doing her part to help me do the processing. We are working together, but our tasks are not the same. The tasks are, in fact, very different from one another. I am aware of my role, and she is aware of her role. I am alone in my role, and she is alone in her role. In a sense, we are working together, but each of us is working alone. Yesterday, however, I learned something about myself, something I did not expect to learn. I learned that, contrary to what I have believed to this point, sometimes I cannot do my work alone–sometimes I need to share the burden with another person. Let me explain: Recently I read a column in the local newspaper discussing the role of fathers in the lives of girls and how the father-daughter relationship can shape a girl’s adult life. As I read this column, memories of my own childhood and my own father flooded back until I felt overwhelmed by feelings of sadness, resentment, and anger–altogether a depressing experience, one I thought I had put to rest. Obviously, the ghosts are still present and active. If you have read my posts, you know something about my relationship with my father. If you have not read my posts, then this post will give you information: Parental Alcoholism, Parental Mental Illness, and Shame: Three Threads In the Tightly-Woven Tapestry of Complex PTSD. When I saw my therapist yesterday, then, I was in a real downer. She and I talked about my father and about my lifelong bouts of feeling invisible (depersonalization), and she helped me as I worked to understand the connection between my father’s behavior and attitude towards me and my experiences with depersonalization and derealization. (For information on derealization, please see my essay titled “Derealization OR Another Trip Down the Rabbit Hole?”) Finally, I could see that my 90-minute session was almost over, and I asked her if there was some way I could do something that would help me lift my mood. She asked me what I would like to do, and I said that maybe some art work would help. So she brought out the colored pencils and paper and set up the small table we used for art. I sat on one side of the table, and she sat across from me. Before I began working, however, I suddenly and impulsively asked her if she would work with me. I simply did not want to do the work by myself. I wanted her company in this effort. No–I needed her company in this effort. She agreed, and we began. She made a squiggle, and I added to her squiggle, and thus we continued–she and I taking turns. I loved it! By the end of my session, we–working together–had created a whimsical, happy little butterfly with a third eye, an eye of intuitive wisdom, so I call it. You can see this blissful little butterfly at the top of this post, winging her way into the sunshine, guided by a bluebird singing a happy song. 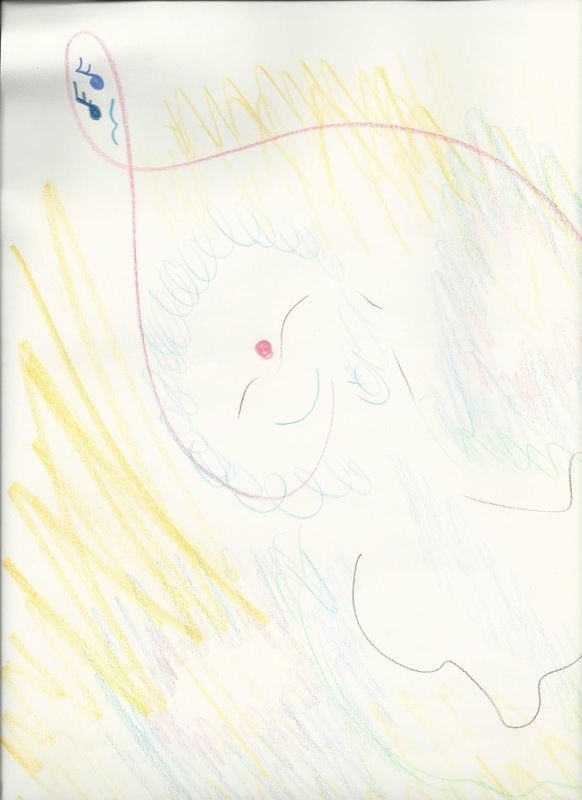 Yesterday, in the process of working together with my therapist to create this blissful little butterfly, I was able to lift myself from the pits of my depressing thoughts and soar into the sunshine, into a much better frame of mind. I had come to my session in a miserable frame of mind, but I left feeling happy because my therapist cared enough to join me in creating that little butterfly with the blue and pink wings. She, in fact, added the bluebird and the music notes. Before I left, she rolled the picture up, tied a ribbon around it, and suggested that I tape it to my refrigerator door. I have done that. I looked at it this morning with my “third eye,” the eye of my inner wisdom, and I saw my therapist’s care for me. That makes me happy! The really happy person is one who can enjoy the scenery when on a detour. Anon.